Spencer Fabrications' custom fabrication capabilities were applied to the construction of a highly customized food vending kiosk. Designed for use in a high traffic retail environment, it was built in the themed style that was created specifically for our client's Florida location. 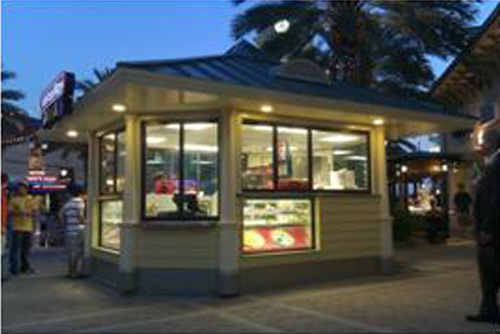 In addition, Spencer Fabrications strategically built this vending kiosk so that the retailer could easily incorporate its own signage, food service equipment and air conditioning as required. We also provided the installation services. 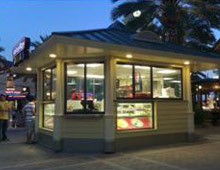 Spencer Fabrications has built a number of themed vending kiosks for several specialty food retailers. For more information on the custom fabrication of this specialized food vending kiosk, see the table below and contact us directly. Product Description This custom vending kiosk was fabricated for a specialty food retailer and installed in a high volume retail outlet. Overall Dimensions Length: 20' 8.5"